Amyuni Technologies, a leading vendor of high-performance development tools announced today the release of the DevTouch Pro, a revolutionary software deployment tool designed for mobile application developers. 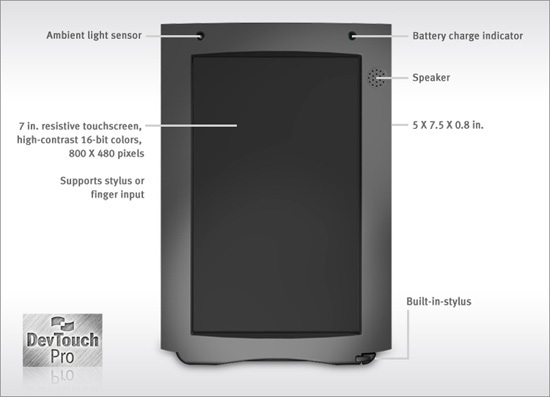 The DevTouch Pro is a color touchscreen tablet designed to provide mobile application developers and product managers with a customizable development, testing, and deployment platform. With the ever-increasing demand for mobile applications, the DevTouch Pro is uniquely positioned: Unlike other mobile application devices and platforms, the DevTouch Pro tablet is configurable, customizable, and most of all—open. With its 7-inch resistive touchscreen, built-in Wi-Fi™and Bluetooth® interfaces, and lightweight design, the DevTouch Pro is all about giving developers and product managers control over their product. 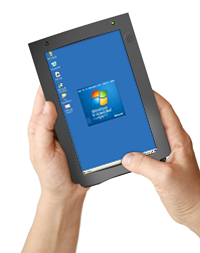 As a portable touchscreen tablet, the DevTouch Pro can be used in various professional field applications such as Health Care and Pharmaceutical or Home Consumer Devices,such as Personal Organizers, Educational Applications and E-book Readers. Capable of supporting custom installations of Windows CE, Android, and Linux operating systems, the DevTouch Pro is able to meet any mobile application development requirement. Visit www.amyuni.com to learn more about the DevTouch Pro. • Is XPS still relevant?